More coldness, more Smew - today there were four in Heron's Green Bay, along with two Greater Scaup and seven Dunlin. A third Scaup was in Stratford Bay, as were five Dunlin, one Water Pipit, a male Ferruginous Duck x Pochard and a male Ring-necked Duck. There was no sign of any Bitterns at Herriott's Bridge from late afternoon until dusk. Hopefully over the winter I'll get chance to update the site with some of the masses of CVL data contained within various bird reports and old WeBS counts that have been gathered over the years. In the meantime here's a nice little graph showing the maximum Smew count each winter since just after the lake was flooded. With overnight temperatures down to -6.5°C, most of yesterdays snow remained on the ground, and the majority of the Lapwing and Dunlin had cleared out. There were some big areas of ice around the edges of the lake (very unusual in November), and as a result Snipe were seen in some strange places, such as the puddle on Moreton Lane and the stream that feeds into Heron's Green Bay (with a Green Sandpiper also there). A Water Pipit was on the shore in front of Stratford hide with 36 Meadow Pipits, the male Red-breasted Merganser was in front of Moreton hide, six Black-tailed Godwits and two Smew were seen in Heron's Green Bay. The cold weather did produce some good reports of our regular birds. First, three Jack Snipe on the pool in front of Stratford hide. Normally they're tucked in amongst the reeds on the far side and are buggers to see, but although the pool itself was frozen there was a small flow of water on the near right-hand side of the pool that leads down to the weedy shore; all three were stood together in the open - probably the best views you could hope for at Chew. A Bittern was seen again during the day along the NE edge of Herriott's Pool, then again as it flew over into the main reedbed at 16:00 this afternoon. Following this, four Bitterns were seen in the air together at dusk. Peacock butterflies aren't the sort of thing you would associate with a day when the temperature didn't rise above -1.5°C, but there was one sat on the step of Moreton hide this afternoon, doing all that swishy-wing nonsense they do when they're disturbed during hibernation. A quick look inside produced another five of them. Two Waxwings were seen briefly in Bishop Sutton this afternoon near the football club; they flew off when a Buzzard came past and didn't return. There are still no records of this species at Chew - perhaps this winter we'll be graced by their presence? Last night's early snow remained on the ground today, and some sheltered parts of the lake had a thin layer of ice. The four Greater Scaup were still off Nunnery Point/Heron's Green Bay this afternoon; other birds included 18 Goosander, the male Red-breasted Merganser, 15-plus Siskins, 24 Dunlin, 35 Pintail, one Peregrine, a flyover Skylark, and two Bitterns seen in flight at Herriott's Pool late this afternoon, one of which flew over the road into the main reedbed. Several small groups of Redwing and Fieldfares were seen all around the lake, and a Water Rail was flushed from the roadside along the A368 near New Manor Farm. There were one or two others showing well along the causeway on the north side of Herriott's Bridge today. 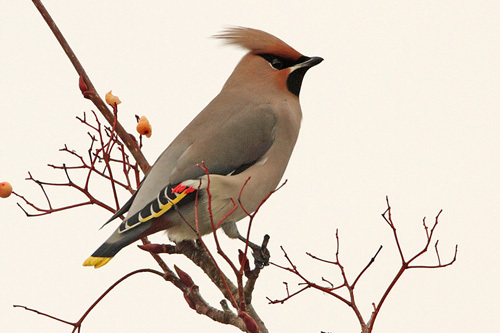 Close but no cigar.... an adult Waxwing at Bishop Sutton this afternoon (Gary Thoburn). Five Greater Scaup (four in Stratford Bay, one in Heron's Green Bay) were seen today, as were the three Bewick's Swans (Twycross), the Red-breasted Merganser (Heron's Green Bay) and the male Ferruginous Duck x Pochard (Stratford Bay). A Nuthatch at Hollow Brook car park continued the theme of 'patch scarcity month'. The Whooper Swan was in Heron's Green Bay this morning (only), also seen were the four Greater Scaup (adult male and female, two first-winters), 14 Goosander, the male Red-breasted Merganser, 63 Dunlin, one Snipe, one Green Sandpiper and one Peregrine. The Black Redstart was still at Woodford Lodge/Bank today, with the rest as follows: one Whooper Swan, 49 Dunlin, five Snipe, one Water Pipit and a Black-necked Grebe (Stratford), one Water Rail and one Green Sandpiper (Heron's Green) and three Bewick's Swans (BK hide). The Black Redstart was still at the lodge today, but there was no sign of the Mandarins. Otherwise, one Whooper Swan, three Bewick's Swans, one Water Pipit (Stratford), 56 Dunlin, three Green Sandpipers, two Snipe, two Black-necked Grebes, one Ferruginous Duck and four Greater Scaup (Nunnery Point). A male Black Redstart was a good find at Woodford Lodge - a quality local patch bird. Speaking of which (in a looser sense of the word), a flock of six Mandarins at Denny today was a record count, and another good record for the lake. The Whooper Swan and three Bewick's Swans were still present. One of the Bewick's was ringed at Slimbridge in January 2003 and is called 'Tinky'. The as yet undetermined adult is believed to be black BCL - 'Winky'. A Bittern was seen in flight across Herriott's Pool this afternoon; other birds today were one Golden Plover, 49 Dunlin, one Black-necked Grebe (Heron's Green Bay), the male Ferruginous Duck and a male Ferruginous Duck x Pochard. 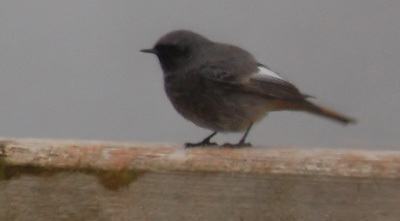 Black Redstart at Woodford Lodge this afternoon (Bob Handford). Nice to get a smart adult male for a change. Two Bitterns were seen again today - one in flight over CVRS, the second was watched from Stratford hide this afternoon, walking along almost the entire length of the shoreline below the main reedbed from Herriott's End to Sutton Wick. The following were also seen: BK hide- three Bewick's Swans, the Ferruginous Duck and Ring-necked Duck; Heron's Green Bay - 12 Goosander, one male Red-breasted Merganser, one Black-necked Grebe, three Green Sandpipers and one Greenshank; Stratford hide - one Whooper Swan (which appears to be anchored to one spot off the spit as it hasn't moved since it got here), one first-winter Mediterranean Gull, 48 Dunlin, 41 Gadwall, one Golden Plover, and one Water Pipit. Both the adult Bewick's at Twycross are wearing Darvik rings; so far only one has been read, so if you get chance, see if you can read the one that has the colour ring on its right leg. A female Pochard seen at CVL this autumn wearing a plastic band on its bill has been traced back to Lac de Grand-Lieu, near Nantes (marked this May). Two Bitterns were watched by the road in the NE corner of Herriott's Pool this evening from 16:30, and a Barn Owl flew over there. A second Barn Owl was seen earlier at Whalley Bank. The Whooper Swan and three Bewick's Swans remained at Stratford/Denny; at Bernard King hide were single adult male Ring-necked Duck, Greater Scaup and Ferruginous Duck, with 75 Meadow Pipits counted feeding on the shore there. 275 Lapwing were seen between Heron's Green Bay and Stratford Bay. Same old....one Whooper Swan, three Bewick's Swans, one Red-breasted Merganser, one Greater Scaup, three Green Sandpipers, one Greenshank, one Ruff, 50-plus Dunlin and at least ten Siskins at Stratford car park. The three Bewick's Swans and the Whooper Swan remained, as did the following - one Black-necked Grebe, one male Ferruginous Duck, one Red-breasted Merganser, one Greater Scaup, one Greenshank, 79 Dunlin, three Green Sandpipers and an adult female Peregrine. A Redpoll was a new bird today. A dismal day of rain and strong south-easterlies, but it did produce some good birds at the lake, best of which were four Avocets in Stratford Bay. Also new-in were two female/juvenile Common Scoters, an additional two Red-breasted Mergansers and an arrival of Dunlin; at least 122 were in Stratford Bay this afternoon. The Whooper Swan (Stratford Bay) and the three Bewick's Swans (Denny) were also still present, and 13 Little Egrets were in Heron's Green Bay/Pool. The three Bewick's Swans (Bernard King hide/Twycross) and the Whooper Swan (Stratford Bay) remained today. A Bittern was seen in flight across Herriott's Pool at 16:25, then, unusually, was watched flying south from the pool over the farmland towards North Widcombe. The adult male Ring-necked Duck was close inshore off Stratford hide this afternoon; other birds seen were nine Little Egrets, 253 Cormorants and one Greenshank. The adult Whooper Swan was still present today, mostly by the spit in front of Stratford hide, but also at Moreton Point earlier in the day. A family of three Bewick's Swans included the Darvik-ringed bird seen at Blagdon yesterday. Other wildfowl included two adult drake Red-breasted Mergansers (making it a seven-merganser month! ), a male Ferruginous Duck and the male Red-crested Pochard (Bernard King hide), and a juvenile male Greater Scaup (Stratford Bay). Other birds seen were a first-winter Mediterranean Gull, one Black-necked Grebe (Moreton), one Greenshank, 61 Dunlin, seven Green Sandpipers and a Jack Snipe (Stratford hide pool). An adult Whooper Swan was a good find in Stratford Bay; it spent most of the afternoon feeding off the spit in front of the hide. Two Bitterns were seen on Herriott's Pool this afternoon; one was on view sat in the reeds for 40 minutes, the other was seen in flight at 16:40. Still present were 49 Dunlin, two Green Sandpipers, 20 Snipe, one Greenshank, two Kingfishers, two Mediterranean Gulls, eight Little Egrets and a Peregrine. Adult Whooper Swan in Stratford Bay this afternoon. The third record since October 2008. Prior to that, the next record was back in 1974. One Great Northern Diver was still present, but tricky to find as it spent a lot of time feeding. A male Red-crested Pochard was at picnic site no.1/Denny, with a family of Bewick's Swans (two adults and a first-winter) nearby at Twycross. The rest was similar to recent days - one male Ferruginous Duck, one male Ring-necked Duck, another Aythya hybrid, one adult male Red-breasted Merganser, one Greenshank, 51 Dunlin, two Green Sandpipers, two Mediterranean Gulls and an adult Peregrine. Some more windy weather overnight delivered a couple of Great Northern Divers to Stratford Bay. November Great Northerns have become an annual event in the last few years, but there hasn't been two together for ages. Probably since at least the 70s. The first-winter male Garganey reappeared in front of Stratford hide, but otherwise little else of note - 13 Goosanders, the male Red-breasted Merganser, four Little Egrets, one Greenshank, 31 Dunlin, six Snipe, one Water Pipit and one adult Peregrine. In blustery, rainy conditions, the following were seen from Stratford hide this morning - two male Ferruginous Ducks (adult and first-winter), 38 Dunlin and two Peregrines. A Slavonian Grebe at Stratford Bay was another new arrival today; later it was seen at Moreton. Also present were a Black-necked Grebe (East Shore), a first-winter male Ferruginous Duck, 27 Dunlin, one Water Pipit and two Little Gulls. No sign of yesterday's Garganey. A late Garganey was seen in the channel north of Herriott's Bridge today, and five redhead Red-breasted Mergansers (not including the usual adult male) was a pretty good count by Chew standards. The male Ring-necked Duck remained, as did one male Ferruginous Duck, the adult Bewick's Swan, 49 Goldeneye, 11 Goosanders, one Greenshank, 23 Dunlin, two Green Sandpipers, two Mediterranean Gulls, two Yellow-legged Gulls, two Peregrines and c.50 Fieldfares. A Smew in Stratford Bay was new-in, as were a few waders - 51 Dunlin (the highest count all year), one Knot, two Ringed Plover and a Greenshank. Still with us were two (male and female) Ferruginous Ducks , the male Ring-necked Duck, six Goosander, the male Red-breasted Merganser and a first-winter Little Gull. Two Tawny Owls were seen in flight over Stratford car-park. A pair of Ferruginous Ducks was still in Stratford Bay today, as was the adult male Ring-necked Duck (now in full kit) and an adult male Red-crested Pochard. The Red-breasted Merganser was also still present, on one occasion in the channel north of Herriott's Bridge with a couple of Goosanders. Also seen today were two Water Pipits, 14 Snipe and 15 Little Egrets. The Cattle Egret was looked for several times today without success. It could still be on one of the farms in the area though. At the lake - two Ferruginous Ducks, two Black-necked Grebes, one Little Gull, four Green Sandpipers, five Dunlin, one Green Sandpiper, one Red-breasted Merganser, and three Water Rails (Heron's Green Pool and Herriott's Bridge). A Cattle Egret was seen briefly in a cattle field at the entrance to Summerlea Farm late this afternoon; the birds at the lake however were similar to the last few days: two Black-necked Grebes, a pair of Ferruginous Ducks, one Red-breasted Merganser, one Little Gull, three Dunlin, 26 Snipe, and one Peregrine. One male Ferruginous Duck (Stratford Bay), the male Red-crested Pochard (Heron's Green Bay), two Black-necked Grebes (Moreton) and a Bittern (Herriott's Pool at 16:48) were still present today. Other birds seen were two Scaup-types in Heron's Green Bay, thought to be hybrids, four Goosanders, one Little Gull, three Dunlin, two Snipe, four Jack Snipe, c.70 Meadow Pipits and c.30 Linnets. A Bittern was seen in flight over Herriott's Pool this morning, other birds today were two Ferruginous Ducks (a male at Stratford and a female at Moreton), two Black-necked Grebes, three Dunlin, a Peregrine and the male Red-breasted Merganser. The female Ferruginous Duck was at Moreton hide today, along with two Black-necked Grebes and three Little Gulls. Five Dunlin and two Goosander were seen in Stratford Bay. A little less of the same from the end of last month, as it would appear that we have lost a significant part of the aythya flock over the weekend. Birds seen today: one adult Bewick's Swan (Twycross), two Black-necked Grebes, one first-winter male Red-crested Pochard, one Red-breasted Merganser, two Goosanders, four Yellow-legged Gulls, one Mediterranean Gull, three Little Gulls, two Ruff, 12 Dunlin, eight Green Sandpipers, one Common Sandpiper, five Snipe and a Peregrine.